Our experience with Hill of Grace Restaurant was perfect from the beginning. When York made the booking over the phone, the lady was extra polite and pleasant to speak to. The whole food experience was sensational. Dennis Leslie- the head chef showed us how Filipino street food can be transformed into gourmet cuisines. 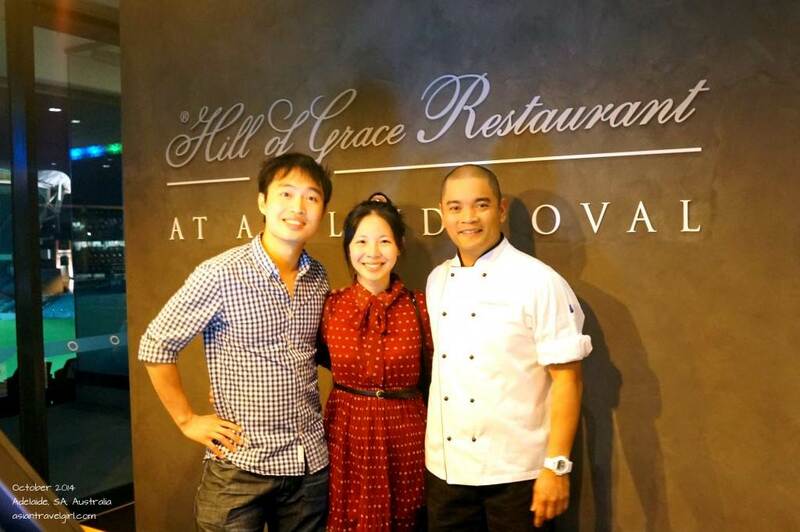 Our experience with Hill of Grace Restaurant was perfect from the beginning. When York made the booking over the phone, the lady was extra polite and pleasant to speak to. She asked all the necessary questions to ensure a pleasant dining experience such as dietary requirement, any special occasion and if we’re having a la cart or degustation. When we stepped out of the elevator on the 3rd floor of the Adelaide Oval, a waitress was already waiting for us around the area. She said the direction to the restaurant wasn’t very clear, so she thought she would wait there to guide us. York already mentioned over the phone that we will have the 8 course degustation for dinner. It was unfortunate that both of us felt a bit sick that night, so we decided to save the 8 famous Henschke matching wines with degustation for our next special occasion. 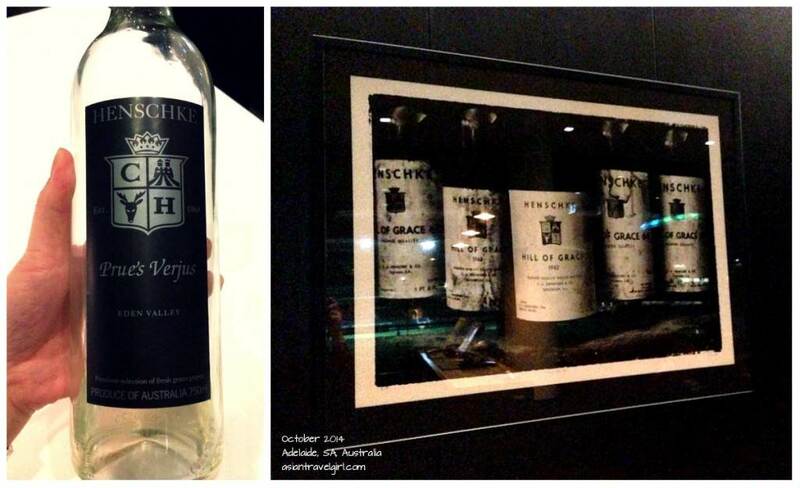 Henschke is one of the best wineries in South Australia’s Eden Valley and “Hill of Grace” is one of Australia’s “cult wines”. 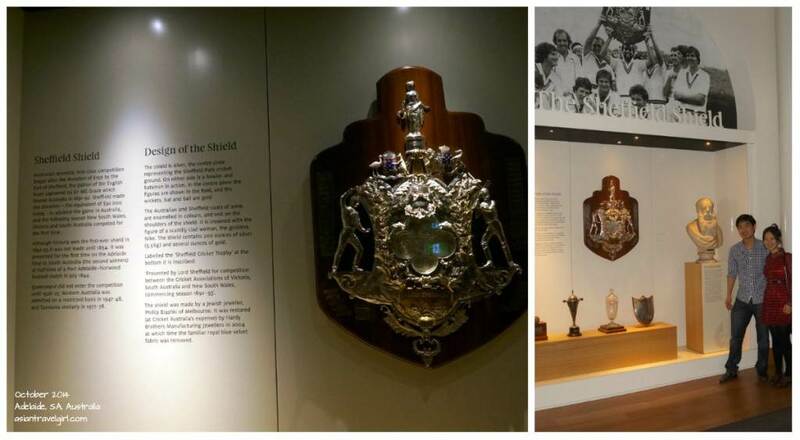 Adelaide Oval is the only place in the world with the priceless collection of “Hill of Grace” from 1958 to the current release. We were seated at a window seat with views to Adelaide Oval. 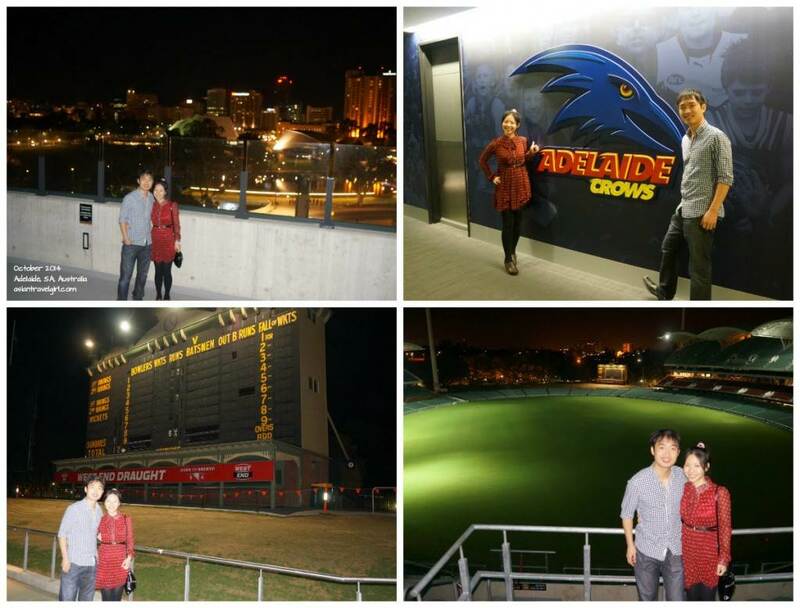 This was the first time I have stepped into Adelaide Oval, I was amazed at the view. Our waiter for the first half of the evening was George (I think that was his name…), he was very informative and enthusiastic from the beginning. The amount of information he provided me that evening probably allows me to write a whole article already! We started our dinner with freshly baked sourdough that has been fermented for 14 hours in the local Mt Barker bakery. York said the butter was so soft that he felt like he was cutting into a piece of yellow cloud. It spread beautifully over the bread as it was quite hot. 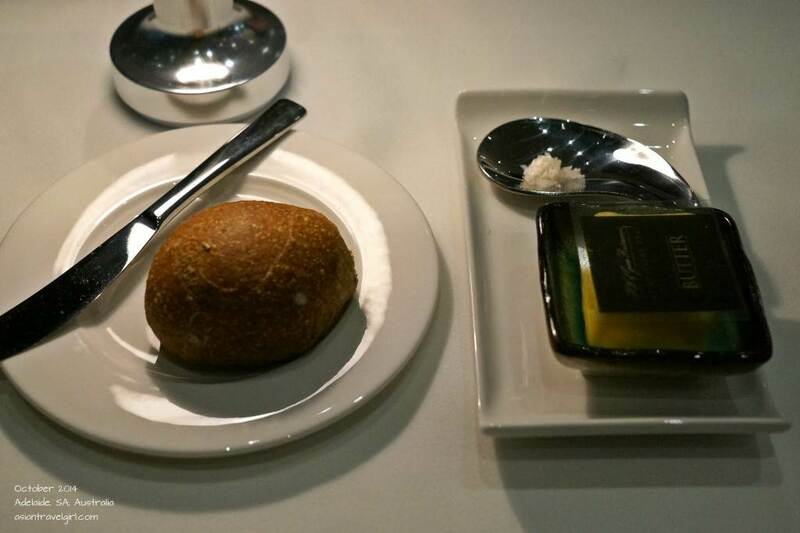 They had rose salt next to the butter for people who prefers extra saltiness. 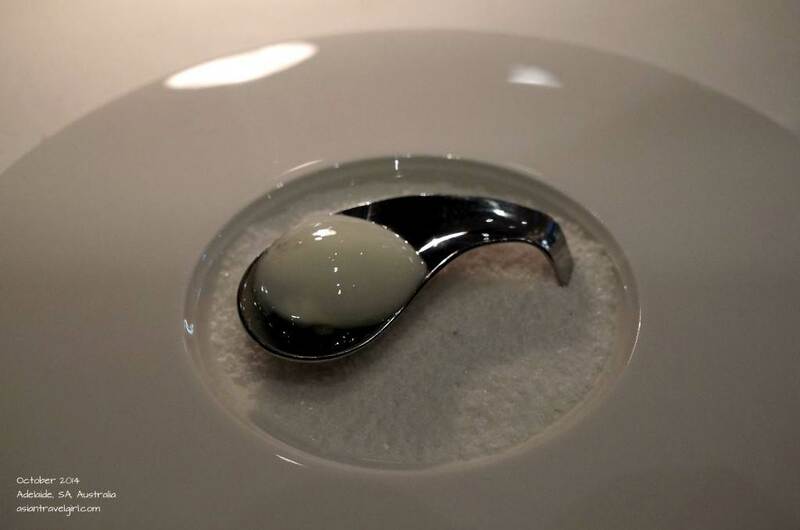 For our starters, we were given a Coffin Bay oyster on a silver spoon that has finger lime mousse with caviars on top (instead of the normal slice of lemon). The oyster tasted deliciously sweet as it was breed with the freshest water facing the Antarctica, the lime also enhanced the natural flavors of the oyster. The head chef Dennis Leslie is Filipino origin, the dishes here largely reflects his heritage. He uses a lot of local ingredients from South Australia, which is great as food tastes great when it is fresh and in season! 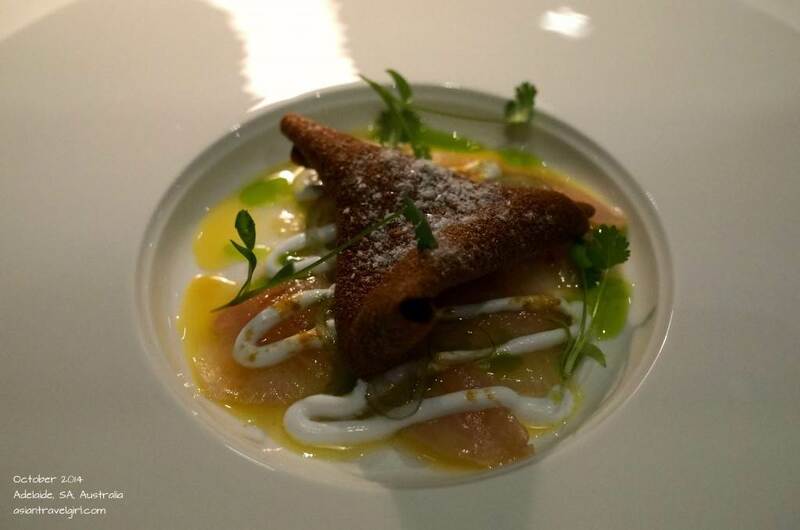 Our first entree was “Kilawin, calamansi cooked kingfish, coconut cream, salt & vinegar prawn cracker”. Kilawin is a traditional Filipino appetizer where the seafood were cured by the vinegar or citrus juices. The kingfish used was caught from Port Lincoln and the whole dish tasted very refreshing. I was enjoying the dish until I had the prawn crackers, it tasted quite heavy. I didn’t like it how it neutralized the refreshing taste from the seafood in my mouth. I guess that is because I don’t even eat sashimi with soy sauce or wasabi, that is why I prefer the natural sweet tastes of the fish. 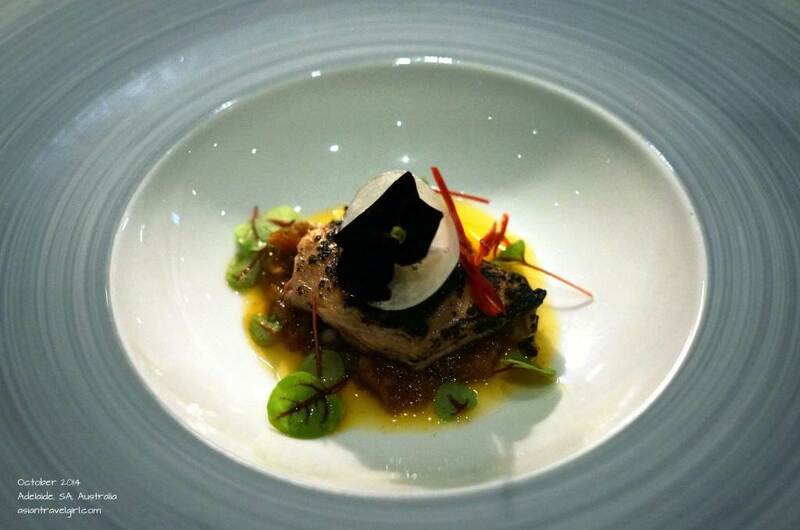 The next on the list was “Tamarind & buttermilk roasted quail, pickled kohlrabi, tamarind chutney”. The theme for this dish was exotic flavours. 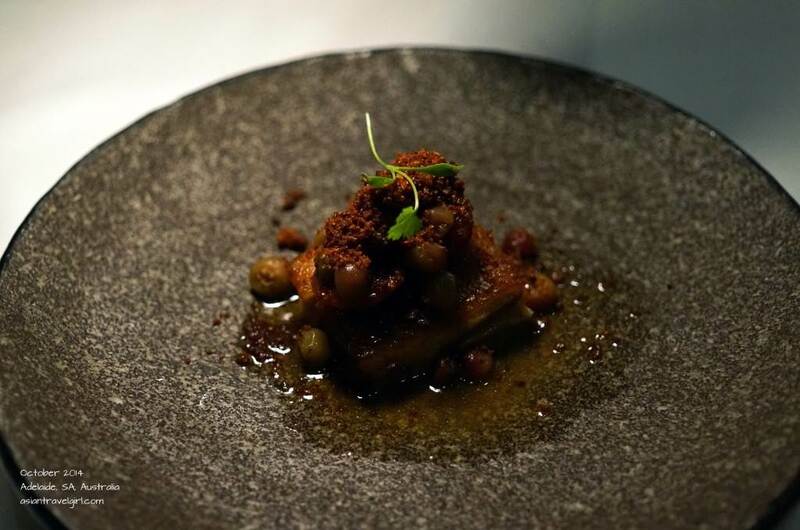 The dish was presented in room temperature to bring out the natural flavors in quails (grown in Gawler region of South Australia). Kohlrabi is a type of cabbage from Germany and has a strong vinegar taste after being pickled. The combination of sour taste slowly opens up your appetite. We definitely couldn’t wait to eat more. 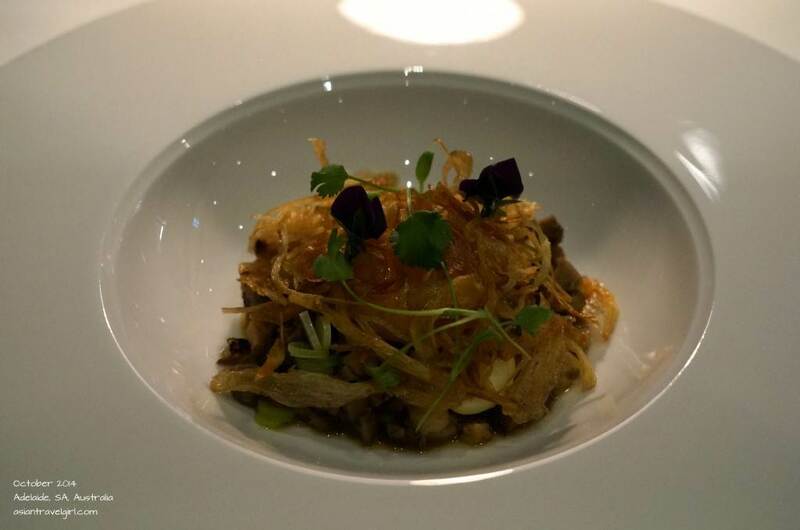 Our third dish was inspired by Filipino street food sisig (grilled pork, spring onion and soft egg). It had diced Berkshire pork grown in the Barossa region, the chef tried to use the as much pork parts in this dish (I think we tasted pig tendons, pig skins, maybe a lot of others). York even told me to close my eyes and enjoy the different textures provided by this dish. 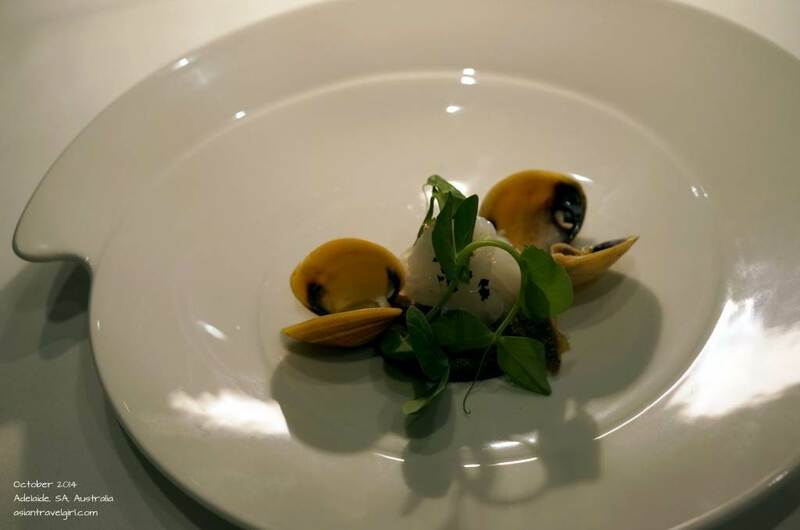 The soft egg in the middle is designed to mix with the whole dish. Once mixed together, the dish became quite creamy. When we were chatting away, George came with a surprise! He brought over 2 wine glasses and poured us some Henschke Prue’s Verjus for us. He said since we weren’t drinking any wines, he and Dennis decided to give us some of these verjuice to see if it compliments with the next dish. Often when kids are dining with adults, they will pour some verjuice for them so it looks like they are drinking wine too. The Henschke verjuice is quite hard to get and it has a melon flavor to it. Most verjuices are used for cooking, however this one you can drink it as well. They do use this verjuice when cooking too. Henschke Prue’s Vergus from premium selections of fresh green grapes. The next dish was “Mullet, laing, cockles, shaved squid”. It is like a mini seafood platter with three different types of seafood. The mullet fish had an interesting flavor, tasted slightly sweet. The leaves and sauces were very herbal and earthy like, by complimenting with the verjuice, it brought out the flavors even more. The cockles were poached in ginger stock until they opened and slightly flavored, this helps to keep its original sweetness. Then we had “Adobo pork belly, muntries, quondongs, coriander”, “adobo” is a type of marinade method used by Filipinos. It was the first time for me to try the two native Australian fruits “muntries” and “quondongs”. I think if we go to Orana in a fortnight’s time, we will probably get to try a lot of native Australian plants too. The muntries were ridiculously sweet, I love the flavor of it. I wonder where you can get them from. It balanced the dish well since the Berkshire pork belly itself tasted quite saucy (although cooked to perfection, it was not too oily and the texture of the skin was just right). However coming from an Asian background, York and I often have dishes like this at home, so we didn’t find it that special. Nevertheless it was delicious! 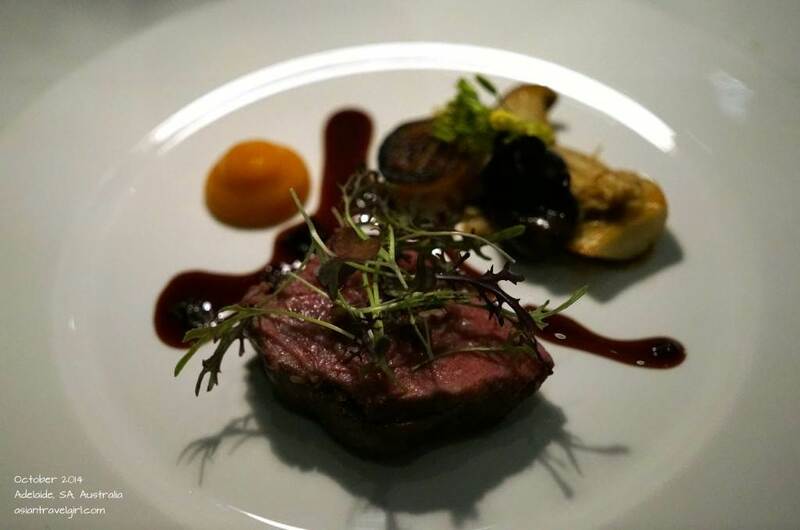 The last of the main course was “Beef fillet, roasted mushroom, butternut pumpkin puree, sour cherry jus, brandy soaked prunes, blackened pearl onion”. The beef fillet was cooked to medium rare and was the right portion to fill up our stomach for the night. There were three different types of mushrooms, one of them was enoki mushroom, I couldn’t remember the other two types, however one of them seemed to be oyster mushroom as it had thick, meaty stem. Each mushrooms has its own distinct flavor which was great dipping between the pumpkin puree and sour cherry jus. York loved this dish as he loves a good mixture of sweetness and sourness in food. We were finally towards the end of our food marathon with only two dessert dishes to go. The first dessert was “Tres leche cake, kumquat marmalade, calamansi curd, calamansi sorbet, crunchy mandarin”. Another name for calamansi is Phillippine lime. The waiter described the sorbert as “punch in the face”… it was indeed had very high citrus content. The sponge cake (tres leche cake) went beautifully with the sobert as the sweetness soaked up the lime, which made it less of a “punch” and felt more refreshing. The crunchy mandarin seemed to include shaved grapefruits. Overall the dessert was a pleasant mixture of sweetness, sourness and bitterness. Very interesting indeed. The last dessert was “Toasted stout sour dough, stout & sour dough ice-cream, roasted dates & pecans, Henschke Prue’s Verjus jelly, feijoa custard, marshmallow”. The waiter said people here called it the breakfast cereal since it has a lot of texture and it is full of crunchiness. He was not wrong, the frozen dried raspberry, toasted sourdough and even the marshmallows, created an explosion of flavours and textures in the mouth. The Henschke Prue’s Verjus we had previously was used to make the jelly. 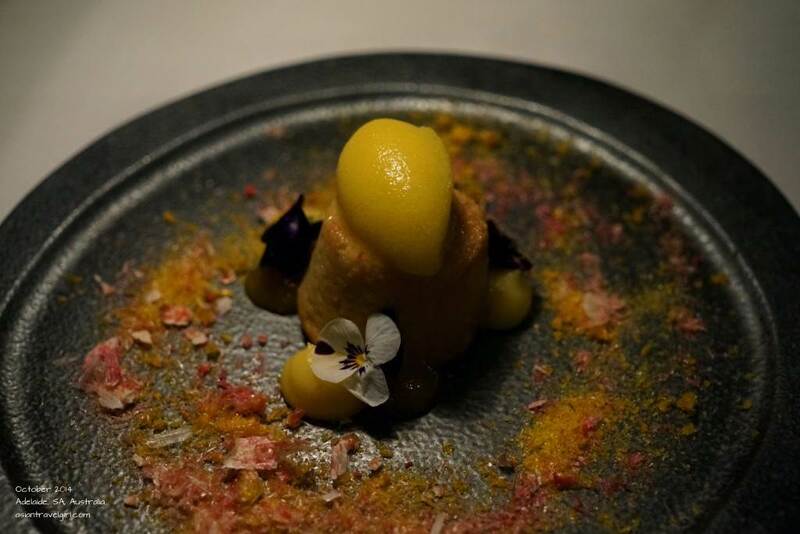 I was pleased to hear that the base of this dessert was made of feijoa, as we had the best feijoa desserts in Auckland (New Zealand) when we visited in May this year. This was the first time we tried feijoa based dessert in Australia, although the taste of feijoa wasn’t as strong as I expected. 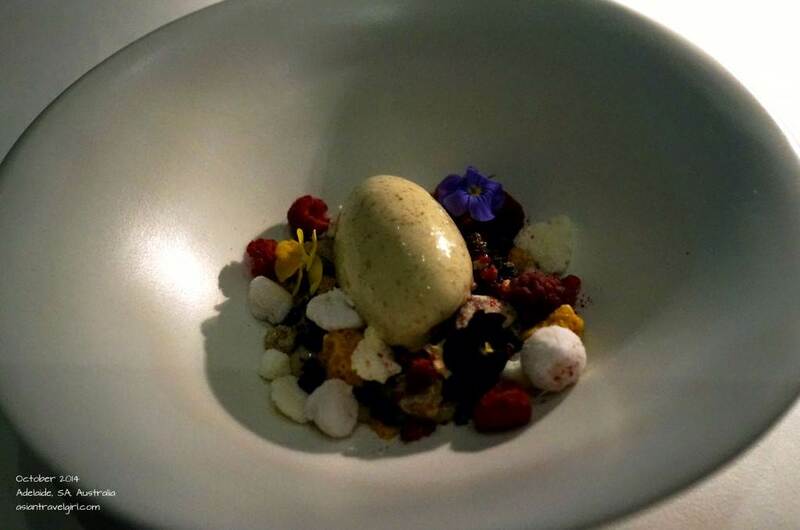 One thing we loved about this dish was the originality of sour dough ice-cream. I don’t even know how to describe this ice cream. I guess you can only come and try it yourself. It is very unique. To our surprise, after our 3 hour long 8 course degustation, the head chef Dennis Leslie came to our table and chatted with us! He used to be the executive chef at Hilton Adelaide “The Brasserie” before taking on this job. 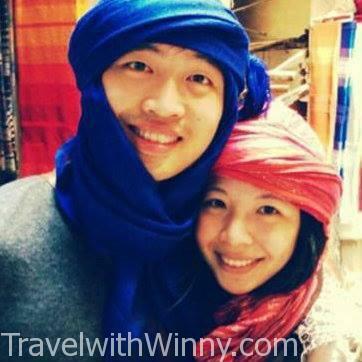 He grew up in Adelaide and even though he has travelled the world, he still loves Adelaide the most. He was so humble, friendly and interesting to talk to. He even took us on a private tour around adelaide at night!! 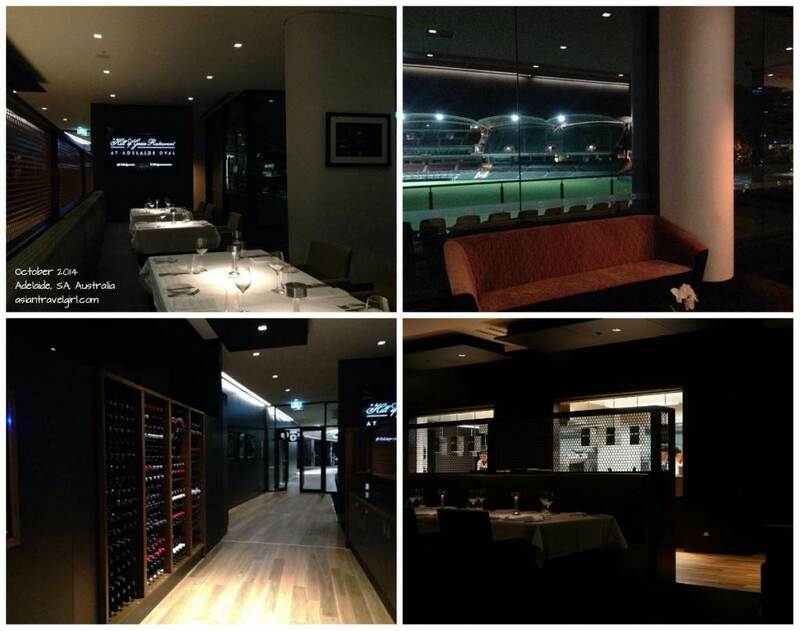 This includes the corporate boxes, VIP lounges, rooms for the cricket and football teams and many more exclusive rooms inaccessible to the public. 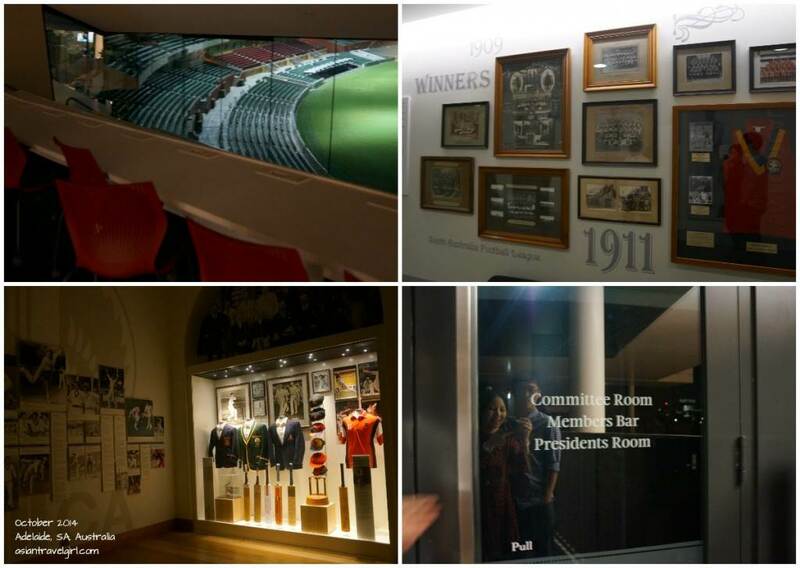 It was such a privilege to gain an insight into different media rooms and places only exclusive members have access to. He told us many fun facts such as where they grow the cricket pitches and plans such as a potential herb garden on one of the blocks. 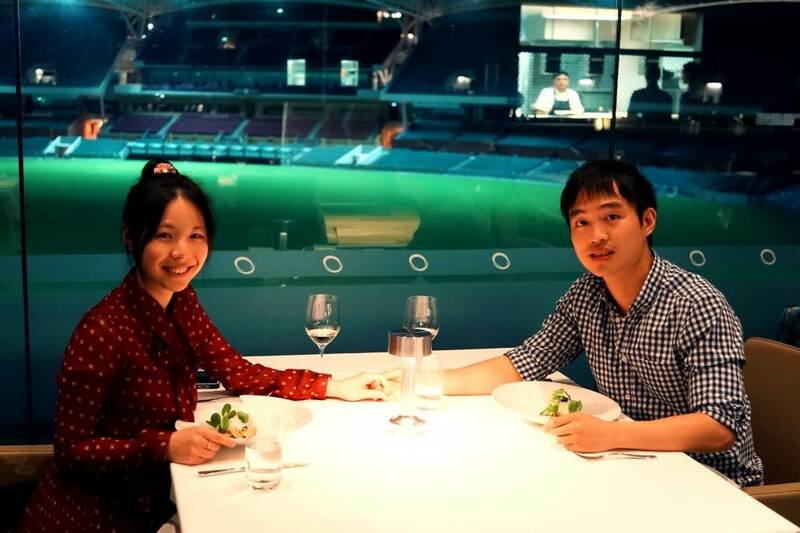 He also said on a game day, the staffs will have to walk twenty-something kilometers to deliver food to every section of the Adelaide Oval. Dennis took so many pictures for us that night, we probably had photos at all the picture-worthy places in Adelaide Oval! PS. the bottom left picture is the oldest score board in SA! Dennis was such a great photographer too. He generously offered to take photos for York and I at the most beautiful locations of Adelaide Oval. Many which we wouldn’t have known or have access to if it wasn’t for him. Just wanted to say a big thank you to Dennis again if he ever reads this blog. Even photo opportunity with the Sheffield Shield! We came back to the restaurant after our 45 min of exclusive tour to finish off our petit four. 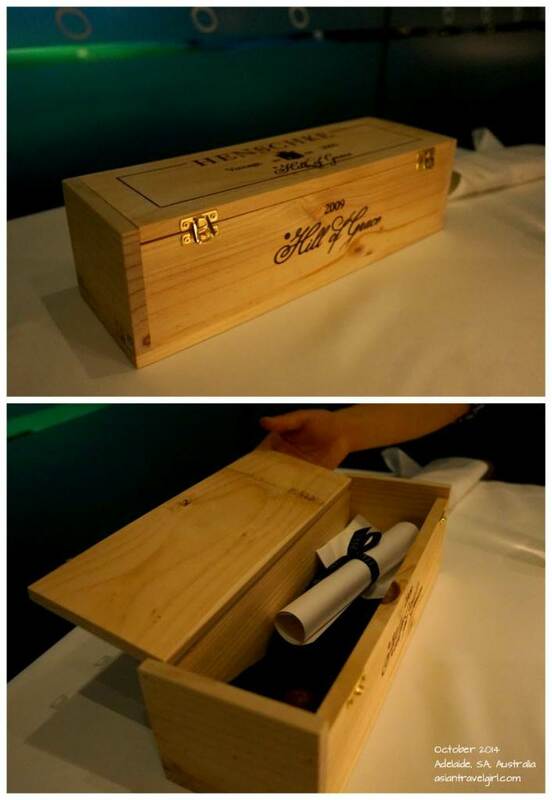 To our surprise, we had a beautiful wooden box on our table containing the petite four (which was delicious ) and tonight’s degustation menu beautifully rolled up and ribboned. Before we left, Dennis signed the menu with our names and wishing to see us again before him and his staff kindly saying goodbye. 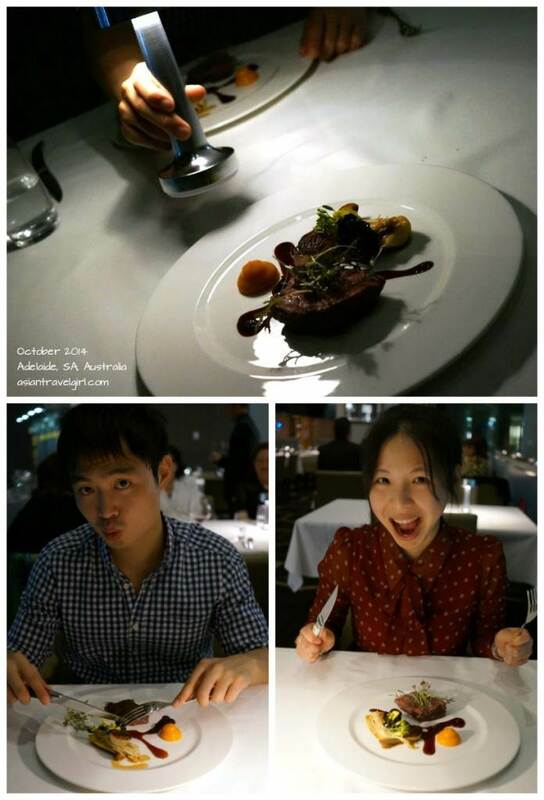 It is definitely one of the best, unexpected and pleasant dining experience for York and I in Australia so far. 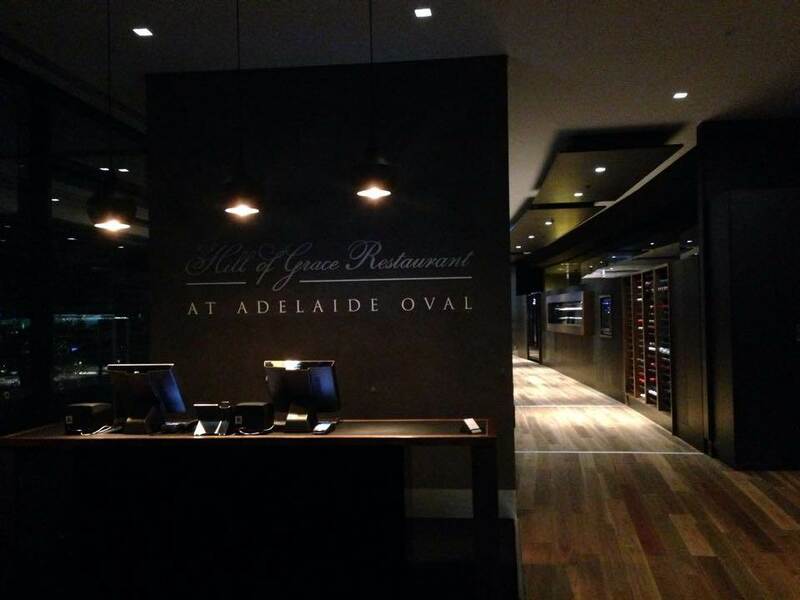 Highly recommend it to my friends and everyone looking for somewhere special in Adelaide. Thanks Dennis for the wonderful dining experience and the fabulous cooking! PS. We really enjoyed the experience so I will translate the blog into Chinese so my parents can read it too (hopefully they will join us for dinner here in the future) 😀 Keep watch! Thank you for reading! If you enjoy our blog or find it useful, please like my Facebook Page to get live updates of my trip and subscribe to read my latest posts! Ciao!